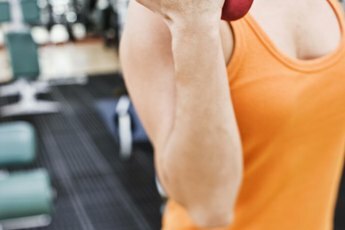 How Much Weight Can Women Gain by Lifting Weights? You might gain weight while lifting weights, but you won't necessarily look heavier. Although many women exercise in the hope of losing weight, regular weight lifting and other strength-based activities can actually cause you to gain weight. However, this weight is in the form of muscle rather than fat, so women who regularly weight lift will typically look slimmer and more toned than women who don't exercise at all or who only exercise minimally. In a society obsessed with muscular men and thin women, it's usually men who choose to bulk up and women who try to slim down. But the claim that women can't bulk up or gain muscle is a myth, according to Colette Dowling in her book, "The Frailty Myth." It can take women longer to build muscle than men because women, on average, product less muscle-building testosterone than men. Nevertheless, with regular training, women -- who do produce some testosterone -- can bulk up quite a bit. If you're hoping to simply tone your body instead, take heart; a few weight-lifting sessions a week are unlikely to result in a major weight gain. Muscle tissue is significantly more dense than fat tissue and therefore tends to weigh more. As you build muscle, you're often burning fat, which can create the appearance of fat being replaced with muscle. You might look slimmer because you've burned fat but, depending upon how much fat you burn and muscle you gain, you might gain weight or remain at the same weight you were before you started working out. Without sufficient protein intake, you won't build healthy muscle tissue and your training routine could stagnate. The Centers for Disease Control and Prevention recommends that women between the ages of 19 and 70 get 46 grams of protein per day. If you are engaging in a very strenuous weight-lifting routine and hoping to bulk up, consider eating even more protein. If, however, you're simply hoping to tone your body, you don't need to exceed the recommendation of 46 grams. Good sources of protein include nuts, lean meats, dairy and soy products. Your weight gain with weight lifting depends on a number of factors, including your starting weight, the intensity of your workout routine, the duration of your workouts and the physical condition you were in before you began weight lifting. Muscle builds slowly and is highly dependent upon diet and overall health. Dixie State College of Utah explains that, on average, people who begin weight training can expect to gain 2 to 4 pounds of muscle in about two months if they have not previously trained. For most women, this means a very minimal weight gain without significant focus on building bulk. Kansas State University: What Are My Calorie, Protein, Fat and Carbohydrate Needs? Is it Possible to Maintain a Flat Stomach Even as You Age?